Every Dog Bred is Another Dog Dead. “Every Dog Bred is Another Dog Dead”. Sobering statement, isn’t it? When I read this, my heart sank. I had to stop and process it and what it meant. After all, it is a shocking statement, obviously meant to. I read this statement in a newsletter a few years ago from ARRF, an Animal Rights Organization, when they used it during a campaign. I had received this newsletter before I lost my two beloved dogs Charlie and Teddy, and it was one more reason for me to decide to never buy a dog again. But it wasn’t my first clue about the repercussions breeding more animals has. My first clue that something wasn’t right about what goes on at some breeders was in 1997 when the pet shop salesman told me that Charlie was missing an ear. 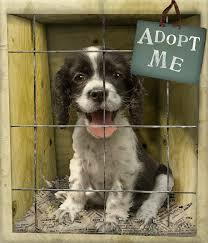 I say some breeders because back then I did not know much about the breeding practices of puppy mills. He told me that all their dogs came from a reputable breeder, but unfortunately accidents sometimes happen. Charlie’s ear accidentally got caught in a closing gate. Charlie was a wonderful smart sweet soul, who only twice exhibited tremendous fear I am guessing was an overreaction due to her accident. But I wondered about what really happened, was it just an isolated accident or was it indicative of mistreatment of all the dogs at the breeder? “Every Dog Bred is Another Dog Dead” led me to think again about breeding practices when there are millions of dogs in shelters that need homes (This applies to cats too, of course). And why are we breeding millions of more dogs in this country when there are so many available wonderful dogs that need a home? As I have written, there are puppies and purebreds available for adoption too, not just adult dogs. I can only think of one main reason, money. Heck, aren’t the expensive designer dogs such as Labradoodles really just a mixed breed? I’m left with the thought that these numbers do not include small rescue groups, foster homes, etc. such as where I adopted my Sophie. Speaking of Sophie, each week I notice another wonderful behavioral change. This week I noticed that she is looking into my eyes now (Still not looking at the camera! ), and rolling around on the floor giving me her belly to rub. She’s pulling out all the toys from her toy basket, which is amazing since she didn’t pick up a toy for over a month. She’s also walking so much more relaxed outside, and for the first time slowly greeted a beautiful Labrador nose to nose. May not sound like much, but seeing her blossom from fear to playful to more trusting means so much to me. People that I have introduced Sophie to in my neighborhood tell me how lucky she is to have been adopted by me. But, I’ll say it again and again it is my joy, reward and luck to have adopted her. Adoption and helping Sophie has brought me more joy that I ever expected. Adopt and save a life. Sophie and Me, Our Transformation! I brought Sophie home almost 6 months ago, and so I’ve been reflecting mainly on two things this week. Twenty-five years ago I would have returned Sophie to her foster mom sometime during the first 2 weeks, and secondly, how amazed, proud and filled with joy I am to see how much she has blossomed and changed. I never expected Sophie to turn my bed into a giant wee wee pad. I know that before I learned how deeply animals feel, and before I learned be a responsible guardian, I would have given her up. Making my bed a pit stop would have definitely been a deal breaker years ago. But, not only do I get to see how much she has learned and changed now, I get to feel the joy from it, and I get to see how much I have learned and changed too. I compare this to my coined phrase and motivational tip “The Other Rewards”. Years ago I wrote about how great I felt when my small jeans fit after I lost weight, but the other rewards I felt came from the pride of small successes on the way. I feel great to see Sophie acting happy like a puppy, but I feel rewarded that as a guardian, my commitment paid off. Don’t get me wrong, it wasn’t easy, but the joy I feel now everyday watching her was well worth it. I didn’t stop trying different things aside from tin foil on the bed to covering my floor for a while with half a dozen wee wee pads to also limiting the space she had early mornings until she did go to the bathroom (Can’t get into all the details, it would take up your whole day). The day I snuck a peak to catch her right in the act on one of the wee wee pads, was the day we headed down the right track. I stuck my head out from around the corner, and in a high pitched excited happy voice yelled out “good girl” over and over and over while jumping for joy. She came running toward me tail wagging and while of course we still had mistakes for the next few months, she began and still runs tail wagging to find me immediately after a pee pee stop looking for praise. I used the same method over and over whenever she would do something positive, including when she would stop to smell some other doggie’s pee pee outside, to more recently my jumping for joy like a crazy girl when she finally did her business outside (I’m sure someone watching me thought I was hilarious). I focused and rewarded her on the positive behaviors, while ignoring or distracting away from the negative behaviors. Going to the bathroom on the appropriate spot at home and going outside were far from the only issues Sophie and I needed to work on. Sophie, the 5- pound little Poodle barked at almost every dog we encountered, and even once she lunged at my neighbor’s giant Newfoundland. While this incident was kind of funny, I didn’t want her to bark at every doggie we would encounter on our walks. I especially didn’t want her to spend her life having fear, which I surmise is much of the reason for her barking at other dogs. Her fears ranged from people to me saying no even though I didn’t say it harshly or in anger. She slightly cowered once when I said no and I knew that my little Sophie and I would overcome her fears slowly but surely, determined that I would never have my best friend cower again. To witness any dog regardless of size cower hurts me to see, but to me it also takes away the dignity and humanity we humans are supposed to have. A boyfriend gave me the book “For the Love of a Dog” by Patricia McConnell PH.D, several years ago, which I dug it out when I brought Sophie home. I learned so much about reconditioning our best friends, or reeducating as I call it, which I have now come to prefer over training (Okay, I view training as a dominatistic stance versus teaching as we teach our children). I highly recommend this book whether we want to overcome fear, fear aggression, or aggression in our dogs, or any other behavior they show while understanding their emotions. One of the biggest reasons I learned that people bring their adopted dogs back to shelters is due to behavioral issues, so I think we can use a lot of help ourselves. Is Sophie perfect now? No, of course not and nor do I expect or want her to be as maybe I once did, but we are well on our way, and I am filled with joy from all the rewards far beyond what I expected when I adopted her. Next: Some statistics on us Americans and Our Companion Animals (And a little more of course about me and Sophie!). Adopt and save a life! I picked up Sophie the day before Christmas from Daryl Masone, a wonderful woman who runs Poodle Rescue of Connecticut. She rescues Poodles, Poodle mixes and other breeds. I found Daryl though the Poodle Club of America during my online rescue search. Daryl explained that she was fostering 2 girl Poodles almost ready for a new home. I answered several questions, gave references, and got her approval to be a new Poodle mom. I also thought that the timing was good over the Christmas holiday since I would be home to help ease her transition for 10 days. So when opportunity knocked to adopt Sophie, my heart said yes. Sophie has a background unlike most shelter dogs, that is, the ones I came across during my online and local shelter searches. Daryl told me that Sophie was 2, beautiful, healthy, bred to be a show dog and shown but surrendered (I think due to shyness). I felt a bit guilty; after all rescuing a dog should be about adopting an abused dog that is waiting in a shelter for a home. But I also knew that after the emotional roller coaster I went through caring for my Teddy for almost a year and charging her medical care beyond my means, that maybe this was meant to be for my first adoption. Sophie needed a home too, and Daryl told me she didn’t have a good life up until then. I surmise that the majority of dogs bred specifically to be show dogs live in kennels, travel a lot, and well, we’ve all seen the extensive grooming, which I doubt isn’t fun for them (More on dog showing another time). I did have a few expectations about bringing home an adult dog, and a dog that may not have been taught to go pee pee on wee wee pads, or on concrete (I live in NYC), or used to the noise on city streets. Of course, I also expected she would need time to adjust to me and a new home. So off I went taking a deep breath with the help of a friend of Daryl’s, a woman who does a lot of rescue work, who drove me 2 hours away to bring Sophie home. When someone puts a puppy in your arms, it is different than when someone puts an adult dog in your arms. At least for me it was. Sophie sat on my lap very still, not budging for a second. I felt as though I was meeting a stranger for the first time knowing she was about to come home with me, or perhaps I felt a bit strange because I was still grieving for Teddy. Puppies usually squirm, lick, and want to play, etc., but Sophie acted like a very quiet good little girl just leaning against me. We packed up, I signed a few papers, said my thank you, and off we went for the 2 hour drive back. Not once did Sophie make a move, or noise. I thought, maybe she’s used to cars and traveling. We arrived home, and I can say the rest of the day was a bit of a blur, Sophie just a quiet little girl, but what did concern me was that she didn’t do pee pee for the next 16 hours. Of course, worried I called Daryl at bedtime who told me that this was not uncommon when a doggie arrives at a new strange home. I was up much of the night checking on her, while she clung to me in bed all night long. Let’s just say she didn’t let me out of her sight all day, all night, and actually all month. When she finally did pee pee, of course it was not on the wee wee pad that morning, nor that first month. In fact, since Sophie was quite the athletic girl with the ability to jump onto my high bed, I’d say my king size bed became one huge wee wee pad. I still thank goodness I had an extra thick blanket on that first day she made her pit stop there. She was determined to continue going on my bed only when I wasn’t home, regardless of my spraying it with OFF for dogs, layering it with toys, pillows, tin foil, trash bags, and me almost beside myself. Sophie the perfectly proportioned stubborn little Poodle was maybe trying to tell me something, I just didn’t know what. During my absence she was confined to a small hallway, and my bedroom and bathroom, plenty of space. In addition if it wasn’t the bed during my absence, it was on my bare floors instead of the wee wee pads when I was home. Making things a bit more complicated was the fact that she wouldn’t go to the bathroom if I were in the room, obviously making it difficult to catch her and gently correct her. Of course, not only did she not go pee pee outside, but also didn’t smell all the wonderful odors that we humans hate, but dogs love. Instead, she would trot alongside me looking up as though we were in the show ring. I think there is a saying that it is harder to break or change habits than first learn new ones. When and where Sophie learned her bathroom habits, this saying seemed to apply. However, with patience and luck, things would change soon; I was committed and not giving up! Next: Sophie becomes a puppy! I am Health & Fitness Specialist with an extensive educational and professional background working in the field for the last 25 years. I hold a Master’s Degree in Health, and undergraduate degrees in Behavioral Science, Nutrition, and Exercise Science along with several certifications. But during this time I also developed a passion for animals. I have experienced firsthand what it is to have a relationship with our best friends, the companion animals we share our homes with. 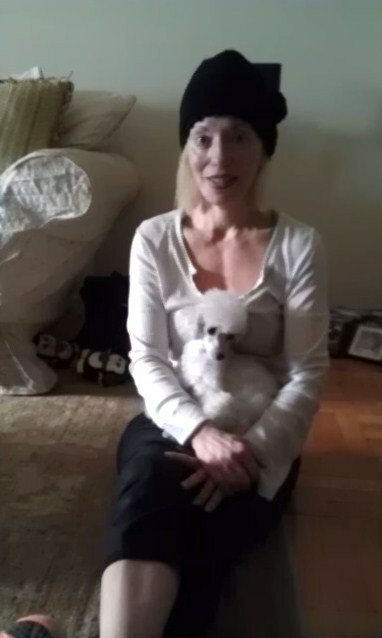 The relationship I had with my Toy Poodles Charlie and Teddy brought me joy, fun, love, and kept me in the moment. I learned so much from them over the span of the 15 years I shared with them. I also felt deep pain when I had to say goodbye. I learned that by giving my unconditional love, a whole new world opened up for me. My life and perceptions changed from living my life with them. While I will continue to help human clients achieve greater health, fitness and weight loss, I now dedicate myself also to Animal Welfare and to helping people with their Canine/Feline friends’ Health through Optimal Nutrition. I hold a post graduate certificate from HSUS in Animal Studies, where I learned about the Animal Protection Movement, it’s Ethical and Cultural bases, Animal Behavior, and scientific discoveries regarding Animal Sentience. I am also a team member of the Guardian Campaign initiated by In Defense of Animals. I recently completed an approved AVMA program as a Veterinary Medical Assistant as well as studies in Canine/Feline Clinical Nutrition. My educational and professional background in Human Health with an M.S. in Health, B.S. in Behavioral Science, A.A.S. in Nutrition, and additional certifications allowed me to enter the nutrition field for dogs and cats. For more information about me, go to www.junefit.com/about_us_june.htm Contact me at june@junefit.com for information about my Canine/Feline Nutritional Consultations. I took a pledge to adopt a companion animal instead of buying one several years ago especially after reading about Best Friend’s Campaign “Puppies are Not Products”. For me, saving a life is very important after learning so much about puppy mills, and even about many breeders. Too much is about making big profits, and well, buying a life now doesn’t seem right to me. Thus my search began knowing that I wanted to save a life by adopting. I went to the ASPCA website since their local shelter is near me, but I also found that I could do an extensive search beyond their shelter by putting in my zip code and the distance I would be willing to travel to. Their search engine gives results for all the shelters and rescue groups within the mile radius you give (Here’s their linkhttp://www.aspca.org/Home/Aspca-nyc/adoptable-dogs ). I had read almost everyday about the thousands of dogs and cats that are waiting for a forever home, but actually seeing all the faces and descriptions of them for hundreds of pages was unbearable, and my heart hurt. I had put in a 25 mile radius for a female dog 3 and under, which brought up hundreds and hundreds of dogs. Puppies, mixed breeds, purebreds, and to my dismay, it appeared that the majority were pitbulls and pitty mixes.I started to think about adopting a pitbull mix, but knowing a strong high energy dog would be hard for me to give the optimal exercise and care, which would not be fair to him or her, so I decided upon a poodle or poodle mix. A small dog such as a poodle would be a more appropriate and mutual match for my lifestyle and abilities. Since my Charlie and Teddy were poodles I am familiar with the breed, and have come to love their mischievous, clever ways. I read that many “experts” don’t recommend bringing home another furry companion too soon, nor bringing home the same breed, but I think this is something very personal, so I decided to start my search and become more familiar with the adoption process figuring I’d take my time to find my new best friend. Sometimes we can’t pick an exact right time, but I did know that I wanted to care for and share my home and heart with another doggie in the future, so my search began. I think that also in beginning my search, I was trying to forget my pain from saying goodbye to Teddy, but as I’ve told so many people who love their companion animals, another one needs and is waiting for that love.I learned that there are not only adult dogs, but also many puppies waiting for homes available from rescue groups. There are purebred rescue groups as well, and thus, Sophie at the age of 2 came home with me and with my commitment to her a forever home. I think once again that in making this commitment, I would no longer be an owner, but now I would be a guardian. I thought about and knew that bringing home an adult dog is different than bringing home a puppy. I admit that part of me was a bit scared; can I love another dog so soon after losing Teddy? I have a saying, or shall I say a tool from my Junefit weight loss program coined, “Make it a Trade-off” because I believe most things in life involve trade-offs. And so, I thought that this included bringing home an adopted adult dog versus a puppy. Some things I expected, and well some I didn’t! Now, of course the trade-offs depend upon the dog we bring home, his or her background, experience, health etc. I had my own preconceived ideas of what to expect, would I need to do, and what I would not need to do for us to live happily ever after. So, taking a deep breath having never adopted a dog before, Sophie came home with me the day before Christmas. I Hope you’ll follow me and Sophie and our homecoming story as we’ve come a very long way in a brief time; and my journey further into the world of animal passion, welfare and animal adoption! I wasn’t always a guardian, I evolved into one while caring for Charlie and Teddy, both girl toy poodles (Yes, girls with boy’s names!). When I refer to myself as a guardian now, I can see a quizzical look on many people’s faces, which usually leads me to explain the difference between a guardian and an owner..But more than using the word, I’ve thought about how I came to feel like a guardian instead of an owner. I called myself one after studying animal welfare 2 years ago, but the feelings of being one really hit me when I had to say to my younger Teddy 7 months ago after we battled a serious disease for 10 months. This after having to goodbye to Charlie barely a year prior during an emergency. But I really became a guardian over the 15 years, losing them one year apart both whom I raised since puppies. Charlie the older of the two wasn’t my first dog, nor was she the first dog that I bought from a pet shop. I bought my first dog Mariko, an Akita puppy in 1988. I’ve always loved big dogs, but at the time as a first time owner, I didn’t give enough thought about how much time I had available to spend with her, to walk her, to take her to the park, to exercise her, housebreak her, etc. The long story short is that I realized after 8 months with my schedule of being gone 8 to 10 hours a day rushing home in -between, well it was more than I could handle. Besides, she was spending too much time alone. I made the decision to find another home and I did. I found a very good home with a family who had a large backyard, worked at home and had another dog. I told myself that this was best for Mariko, but I did feel guilty about giving her away. I never thought about how she would feel going to a new strange home. I didn’t think about a dog’s feelings, except that she would be happier with them than being crated for hours alone. A few months later, off I went to buy a cat, certain that cats tolerate being alone much better, only to decide later on to give him, Smokey my blue Persian, a companion cat, who I named Cotton.A year later, a friend bought a puppy, and after listening to her talk so much about her new puppy, I began to stop in the neighborhood pet shop to look at dogs. I didn’t think I would actually bring one home, but this time I thought about my lifestyle before looking at the adorable puppies and chatting with the salesman. When the salesman put this tiny poodle in my arms telling me that she was missing an ear because there was an accident at the breeder catching her ear in a gate, my decision was made. Besides, she just laid in my arms staring at me, how could I resist? I bought little Charlie from this pet shop in 1997 still unaware of puppy mills and the abuse that has been exposed over recent years. Unfortunately several months later, I realized that a family of 3 animals was biting off more than I can chew, so when Cotton was about 10 months old I gave him to one of my clients who was a Cat lover, and had just lost her cat. I thought that he would adjust, after all he was under a year old, would have a cat friend waiting at his new home, and I would still get to see him. What I didn’t expect was to find that he acted in a manner resembling a human depression for over 6 months in his new home. My client even called in an animal behaviorist after a visit to the vet confirming that he was healthy. This was my first exposure to realizing how deeply animals feel. By now my Charlie was about 2 and had been an easy puppy giving me very little work. She was an angel, she would watch my every move, look me adoringly in the eyes, study my moods, try to please me, and as a student of behavior I loved observing her and especially 3 years later watching her interact with Teddy, a little devil. And how we all played together! Teddy though was not an easy puppy, and to this day, I credit a lot of my new found patience to her, and to learning how deeply animals feel. Over time I observed how they grew from puppies to adults, how they expressed emotions from joy to fear to pain. I had to say goodbye to Charlie almost 2 years ago after sharing 14 years with her; then more recently I had to say goodbye to Teddy at 10 years of age after much heartfelt care. I feel that I changed after sharing my life with these little girl doggies. I became more patient, nurturing, and loving in general. Now as Guardian to Sophie, my role is one of protector, health advocate, human parent and buddy. It is a relationship, as many animal lovers know, unlike any other. In fact it was my love that grew for these special little beings that led me to my passion to study about animals, about their welfare and the movement to protect them. I’m now adding to my human health career a consulting practice for our best furry friends having just finished a Veterinary Medical Assistant program and Nutrition studies for Canines and Felines . I hope to help other guardians, as well as take the best care of Sophie that I can, because I am her Guardian. Next, Sophie comes home, my first adoption. I Was an Owner, Now I’m a Guardian. My name is June Lay, and for 12 years I’ve been known to my readers as Junefit for my Health & Fitness tips. I recently decided to take a break from my weekly Junefit column to think about a new path I have found myself on. I didn’t have a plan to start, and don’t know where I’ll wind up. You see, several years ago I went back to school at The Humane Society of The United States for Animal Studies and well, I learned too much I think to turn back. I’m a passionate animal lover, animal advocate, and Guardian of Sophie my recently adopted Toy Poodle. While I always liked all animals and I had begun my journey to learning about the animal protection movement prior to my studies, I learned during my studies why the movement is so important. I always tell people that I learned too much, didn’t want to learn so many horrible things but I tried my best since I felt it wouldn’t be right to put my head in the sand. I recently took the pledge to call myself a guardian rather than an owner, which is a vital step to protecting the companion animals we share our homes with, and including all the animals we share our earth with. Over the last few years I’d signed up with a dozen or so animal organizations, and since then I’ve been getting their newsletters in my email box. This is where I learned about the Guardian Campaign initiated by In Defense of Animals www.idausa.org In fact, some friends think I go over board because I don’t like the word pet either. 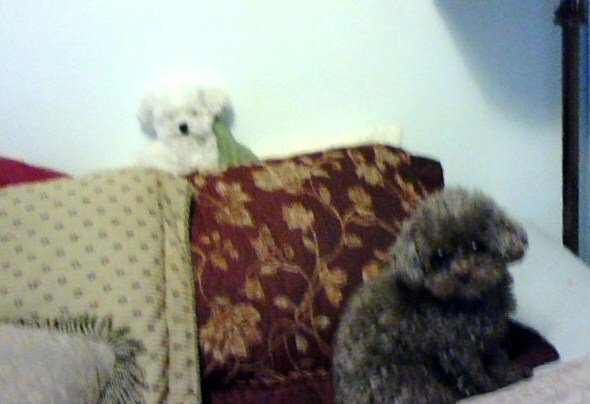 So from here on I will either call my Sophie my companion animal (term used in the animal protection world), or furry friend, furry baby, etc., even though of course Poodles don’t have fur, they have hair! I’ll also call myself her human mom, or guardian, and just about anything but owner. I do feel like a guardian because I take care of her like a child that will never grow up. She isn’t an object or property that I own, or at least this isn’t how our dogs and cats should be treated legally. But as their owners, legally they are property. Check out my link to In Defense of Animals to learn more.So, I can now say that I was an owner once, but now I’m a guardian, and it didn’t happen over night. It happened over 15 years of caring for my two little dogs that I recently had to say goodbye to. I told people then when I had to say goodbye, that “I didn’t carry them for 9 months, didn’t give birth to them, and they didn’t look like me, but I cared for them every day of their lives as my babies,” babies that never grew up always dependent upon me. Maybe this was my first step in realizing that ” I was an owner, but now I’m a guardian”. The Life of a Show Dog, Abuse of Another Kind? All Dogs are Good Dogs! Sophie and Me; the Love Grows! Pit Bulls, Our Best Friends!